As a member of the UNHRC, Eritrea will have the right to vote on UN’s human rights resolutions, including the ones that are about its own abuses, for a period of three years. Eritrea’s membership will be highly embarrassing for the UNHRC, which claims human rights are “indivisible, interrelated, interdependent and mutually reinforcing”. After all, the organisation itself accused the country of committing “crimes against humanity” as recently as two years ago. And not much has changed in Eritrea in the past two years. Only last week Human Rights Watch reported that “repressive tactics continue despite changes in Eritrea’s diplomatic engagements”. So, as Eritrea prepares to take its place in a top human rights body, let me provide some insight into what the country really looks like today, despite high hopes and optimistic media reports about imminent political changes. The international community has been waiting for Afwerki to announce the end of the indefinite national service ever since his regime signed a peace deal with Ethiopia on July 9. But three months after the signing of the agreement, Eritreans still have no indication as to when their service will come to an end. Eritrea introduced an 18-month compulsory national service for young Eritreans in 1994. However, when relations deteriorated with neighbouring Ethiopia following the 1998-2000 war, the national service was extended indefinitely. After relations between the two countries started to normalise earlier this year, the expectation was for the national service to be reduced to 18 months as before. At first, there were some false hopes and misleading news, with the latest batch of recruits to Eritrea’s national service having been told in July that their service will last no longer than 18 months. But earlier this month the Chairman of the National Union of Eritrean Youth and Students Saleh Ahmeddin told national service recruits at the Sawa military training academy that the nation-building process is “limitless homework”, indicating their service may not come to an end anytime soon. In less than one month since the borders between Eritrea and Ethiopia were reopened on September 11, more than 15,000 Eritreans, majority women and unaccompanied children, have arrived in Ethiopia. When citizens flee in droves from peace, not war, that should be seen as a sign of their lack of confidence in their leaders. Months have passed without any explanations about what the peace deal will actually mean for Eritreans. This silence was enough for many Eritreans, who know the tactics of their repressive government all too well, to decide that their children can only have a future outside Eritrea. Under normal circumstances, it is impossible for any Eritrean above the age of five to leave the country legally. As no one knows when the border with Ethiopia may be closed again, many families are choosing to send their children to the refugee camps in Ethiopia now. They believe these children would be better off in a refugee camp in Ethiopia than they would be at home, living under a repressive and unpredictable regime. Of course, the prospects for Eritrean refugees in Ethiopia are not great either. The international community seems to believe – or rather is pretending to believe – that things have improved in Eritrea. This is why it is not within the priorities of the UNHCR to help these people or settle them in a third country. Moreover, unlike other neighbouring countries where Eritreans were able to request passport by signing the apology form after fleeing their country, they are not able to do so in Ethiopia. Eritreans experienced one positive change in their lives since the rapprochement with Ethiopia. After the borders with Ethiopia were reopened in September, the country has seen an influx of Ethiopian commodities as the Eritrean authorities allowed free movement of goods without any taxes or conditions. This caused a significant drop in prices, especially for food items. This, however, is nothing but a temporary relief. Eritreans cannot withdraw more than 5,000 Nakfa (about $300 in the official exchange rate) in any given month from their saving accounts and there is an acute lack of hard currency in the country. For Eritrean investors, all opportunities are still closed. Import and export business has been banned since 2003, and construction has been outlawed since May 2006. Taking the market potential and extremely unfavourable conditions into consideration, Ethiopian businesses are unlikely to invest in Eritrea. A few months down the road – once Eritrea starts levying tariffs on Ethiopian products, the situation will go back to how it used to be, with the Eritrean population facing serious scarcity of basic goods. While the rapprochement between Eritrea and Ethiopia had not really changed much the lives of Eritreans, it has boosted Afwerki’s regime. The Eritrean president, who until recently was facing international isolation, now enjoys attention from global powers. Now, he is in a prime position to benefit from regional conflicts and power plays. Eritrea is located on the Maritime Silk Road essential to China’s Belt and Road initiative and across the Red Sea from Saudi Arabia and the UAE’s never-ending war in Yemen. And with its long coastline, it is in a particularly suitable spot for another US military base in the region. Both Ethiopia’s Prime Minister Abiy Ahmed and Afwerki are already receiving accolades from the UAE and Saudi Arabia for their “services” or expected services in the ongoing conflict in Yemen. It is not difficult to guess where this courtship would eventually lead – sending troops to Yemen. President Afwerki has long been shy of bringing his family members to the political front line, but this has started to change recently. 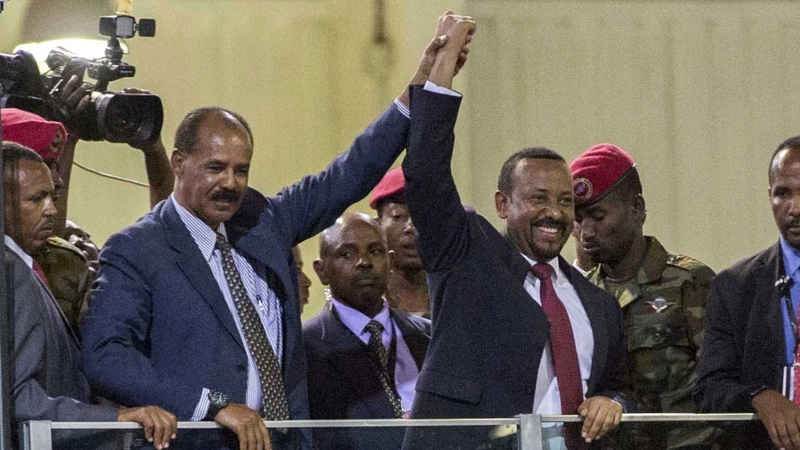 His eldest son, Abraham Isaias Afwerki, has started to appear in public events, particularly since the signing of the peace deal with Ethiopia. He, for example, was part of the Eritrean delegation to Saudi Arabia. Citing diplomatic sources from Asmara, Paris-based independent Radio Erena reported that Abraham Afwerki has assumed the role of special adviser for strategic studies to the president. It appears that he is possibly being groomed to be his father’s successor. That, of course, would not be out of character for President Afwerki, who has enjoyed personalised power in Eritrea for decades. The peace deal with Ethiopia and renewed attention from global powers will allow him to retain his grip on power. Now, he will care even less about internal discontent or improving the lot of his people, since he believes he has secured strong regional and global allies. In other words, the world is not doing the Eritrean people a favour by turning a blind eye to the regime’s abuses, gushing about Eritrea’s recent diplomatic achievements and welcoming it to its top human rights body. Rohingya crisis: One year on, do they want to return to Myanmar?